Home » How many watt LED Lamp do I need to replace conventional lamp? A lot of time we are asked what is the equivalent LED product to convert from Metal Halide, High Pressure Sodium or Mercury Vapor. And a lot of time, we have a product in mind that works based on past experience. But how did we come up with that product, and how did we make the original decision on what was the proper replacement? There’s a lot of science that goes into light, color, quality, and each light had it’s own characteristics. This time I want to talk about the S/P ratio which is usually ignored by most lighting manufacturers and sellers. You might have noticed that some lighting products have an S/P ratio among their specifications. To explain what this means, consider that human vision behaves differently depending on the amount of ambient light available. This applies for both natural and artificial lighting. Human eyes have two types of photoreceptor cells: cones and rods. The response of cones is dominant during daytime or in well-illuminated indoor spaces, while rods are used mostly in dark environments or at night. Thus, humans have two different visual responses: photopic vision for bright environments, and scotopic vision for dark locations. The two visual responses may overlap under certain conditions like dusk, and this is called mesopic vision. When the lumen output of lighting products is measured, the specified value is based on how photopic vision would perceive the light source. As a result, rated lumens describe the lighting output better during daytime, or for indoor spaces with plenty of lighting. Photopic lumens can be misleading when comparing lighting products that will be used outdoors at night or in darker indoor environments. Both types of vision are sensitive to green and yellow light, but their response is very different for other wavelengths. While photopic vision responds better to colors in the red side of the lighting spectrum, scotopic vision responds better to blue tones. As a result, the rated lumen output of a lamp changes for photopic and scotopic vision. If the output of a lamp is measured as 12,000 lumens under scotopic vision and 8,000 lumens under photopic vision, its S/P ratio is 1.5 (12,000 lm / 8,000 lm). You may notice that some LED replacements for HID lamps have less rated lumens, yet they appear equally bright. This happens because the specified lumens are photopic, even for applications where scotopic vision is more important. Both light sources appear equally bright in applications where scotopic vision predominates, such as nighttime outdoor lighting. When specifying outdoor fixtures, make sure you check how the S/P ratios of the existing system and the proposed upgrade compare. In most cases, the S/P ratio of LED and fluorescent lighting outclasses that of HID lighting – you may find that a product with less rated lumens actually provides better lighting! 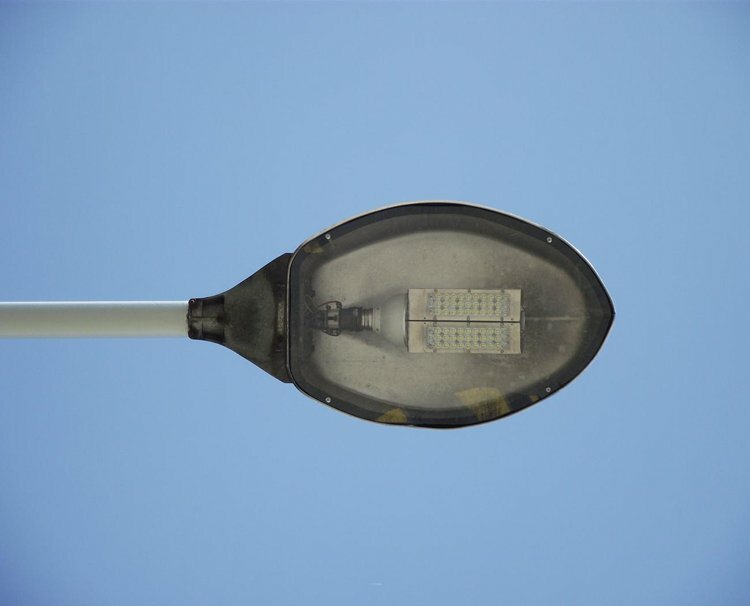 Well, if you still don’t quite understand about this, you can just remember this: A good general idea of what wattage of LED will replace an equivalent HPS wattage , is to divide the HPS wattage by 3. 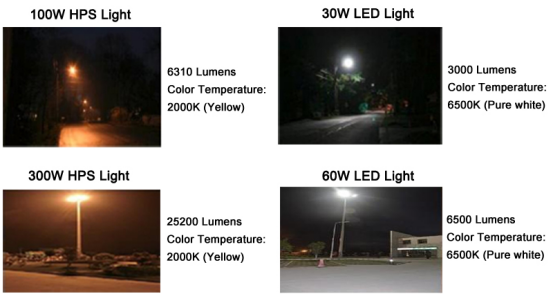 Except the Lumens output, the color temperature is another important parameter that should be taken into account when replacing HPS fixtures with LED fixtures in some cases. We can see some differences from the below pictures. Fireflier Lighting focus on LED Industrial Lighting solutions, if you are looking for a proper lighting solution or any questions about LED light, just contact us freely: leo@fireflier.com . Thanks for your reading.